The ABI 7500 Real-Time PCR systems are integrated solutions, for the detection and quantification of nucleic acids combining responsive software, pre boxed or custom assays, and advanced thermal cycling systems for a vast array of applications. This thermal cycler also features a flexible five color detection system, that’s simple to calibrate to your choice of dyes without the need of added filtration. The innovative optical multicomponenting algorithm offers superior multiplexing while minimizing spectral cross talk. Thermal uniformity is ensured in this qPCR thanks to a tailored Peltier-based 7500 block. Using the largest range of dyes, including NEDTM/TAMRATM/Cy3, VIC/JOETM, ROXTM/ Texas Red, and Cy5, and FAMTM/SYBR Green. At a later date this real Time PCR can be upgraded to a Fast System, by swapping out the thermal block with a Fast Block, and upgrading the software purchased separately from the manufacturer. The ABI 7500 Real-Time PCR system allows for greater sensitivity and variable excitation capacity. A novel 96-well design coupled with faster ramp rates yield faster results without compromising assay quality or extension times. With over 785,000 TaqMan Gene Expression assays, and validated reagents, the Applied Biosystems 7500 qPCR system is the original solution. TaqMan probes are designed to increase the specificity of quantitative PCR, through hydrolysis probes. 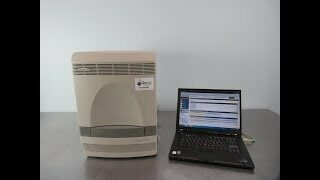 16 x 18 x 24"
This ABI real-time PCR includes computer workstation running SDS 2.3 software, has been thoroughly inspected and is performing to expectations. All of our lab equipment comes backed with our standard warranty. Should you have any questions, please ask, we're happy to help!